AFP Interactive Flutter Bug is a challenging cat toy. For hours of fun, maintaining a good physical condition and reducing stress. 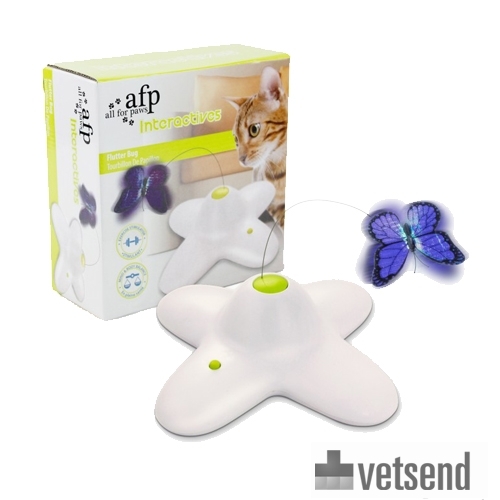 The All For Paws Interactive Flutter Bug provides your cat with hours of fun! The glittering, fluttering butterfly is a challenging toy for cats to chase. In addition to playing, the cat stays in good physical condition and any stress is reduced. The AFP Interactive Flutter Bug is supplied with a spare butterfly. Requires 3 x AA batteries (not included). Your cat can have endless fun with the AFP Interactive Flutter Bug! Length: 25 cm, width: 25 cm, height: 8 cm. Have you used AFP Interactive Flutter Bug before? Let us know what you think about this product.